Fuel cell microgrids are on the rise, the result of a natural pairing of two technologies-fuel cells and microgrids- that serve a mutual mission. Together, they meet today’s demand for energy that is cost-competitive, highly reliable, clean, quiet, contained, modular, scalable and community-friendly. Once futuristic, both technologies find themselves at the right time and place, as the North American grid becomes increasingly distributed. America flirted with the idea of microgrids for decades. But microgrids were largely confined to college campuses. Then in 2012 Superstorm Sandy jolted the nation into understanding the fragility of its centralized power grid and the value of distributed energy. Today, a wide range of businesses, institutions and communities are installing microgrids. Fuel cells have followed a similar trajectory and now operate in more than 40 states, according to the Fuel Cell and Hydrogen Energy Association (FCHEA). Navigant Research forecasts strong, growing demand for both fuel cells and microgrids over the next several years. Worldwide, fuel cell installations are expected to increase more than 10-fold, from 262 MW installed in 2016 to over 3,000 MW nine years later. That should put the market for new stationary fuel cells at $16.2 billion in 2025, according to the research firm. 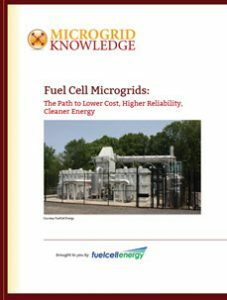 This special report written by the editors of Microgrid Knowledge explores why fuel cell microgrids are on the rise, how they save energy, provide resiliency and more. Click the button below to download this special report.